The Energy Charter Treaty, initiated by the 1991 European Energy Charter and completed in December 1994, is an innovative major multilateral investment and trade treaty. The book has an introduction by Ruud Lubbers who, as the Dutch Prime Minister, played the key role in initiating the Energy Charter negotiations. It brings together contributions on the energy/investment background, the geopolitical context, the Energy Charter negotiations and the relevant specific topics of the Treaty (focusing on investment and trade, but also environment, competition and transit) by the key specialists on the subject, ranging from countries such as the US (which in the end decided not to join the Treaty) to Russia and Kazakhstan, including energy and investment specialists, international investment and commercial lawyers and arbitrators. The contributors include noted international energy/economic law authorities, but also key participants and observers of the Treaty negotiations. 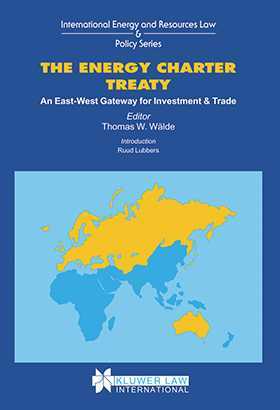 This book is intended to provide the first authoritative analysis of the background, negotiations and content of the Energy Charter Treaty and to provide support and guidance for subsequent negotiations and the difficult challenges involved in interpretation and application of the Treaty. It will be an essential tool for anybody working with the Energy Charter Treaty. The book contains in its annex the major documents of the Treaty: The 1991 European Energy Charter, the 1994 Treaty and its relevant Protocols, Annexes, Understandings and Final Act Declarations. Foreword. Introduction. 1. Overview. 2. International Oil & Gas Investment in the CIS States. 3. Eurasian Energy Politics and Prospects: Need for a Long-Term Western Strategy. 4. Investing in the Former Soviet Union's Oil Industry: The Energy Charter Treaty and its Implications for Mitigating Political Risk. 5. Negotiating the Energy Charter Treaty. 6. The Energy Charter Treaty: A Russian Perspective. 7. The Energy Charter Agreement and the Development of Kazakh Legislation. 8. An Oil & Gas Industry Perspective. 9. The United States and the Energy Charter Treaty: Misgivings and Miperceptions. 10. The Energy Charter Treaty: Towards a New International Order for Trade & Investment or a Case of History Repeating Itself? 11. The Energy Charter Treaty: Some Observations on its International Context and Internal Structure. 12. The Energy Charter Treaty in the Context of the Treaties of the European Union. 13. International Investment under the 1994 Energy Charter Treaty. 14. The Energy Charter Treaty and Bilateral Investment Treaty Regimes. 15. The Energy Charter Treaty and Investment Contracts: Towards Security of Contracts. 16. Back to the Future: Expropriation in the Energy Charter Treaty. 17. Compensation for Nationalization: The Provision in the Energy Charter Treaty. 18. Arbitration Provisions in the BITs and the Energy Charter Treaty. 19. Arbitration without Privity. 20. Trade and Investment Measures in the Energy Charter Treaty. 21. The Trade Rules of GATT and Related Instruments and the Energy Charter Treaty. 22. Transit of Networkbound Energy: The European Experience. 23. Environmental Protection under the Energy Charter Treaty. 24. Legal Implications of the Energy Charter Treaty Competition Rules and Liberalisation. 25. The Energy Charter Treaty: Implementation and Compliance Issues. 26. Transitional Arrangements and Privatisation in Russia. 27. Epilogue: The Energy Charter Treaty as a Work in Progress. Appendices. Index.